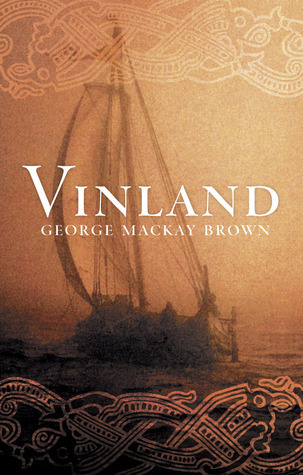 At first glance, this book is another of those telling the life-story from boyhood to old age (if he is the narrator) or death of some lad who, when the north was torn between its “pagan” past and its “Christian” future, sails west with the Vikings and visits Iceland, Greenland and Vinland, but it is much more than that. For a start, it was, I believe, the first of the sub-genre, apart from Henry Treece’s classic Viking Saga – Viking’s Dawn, The Road to Miklagard and Viking’s Sunset. 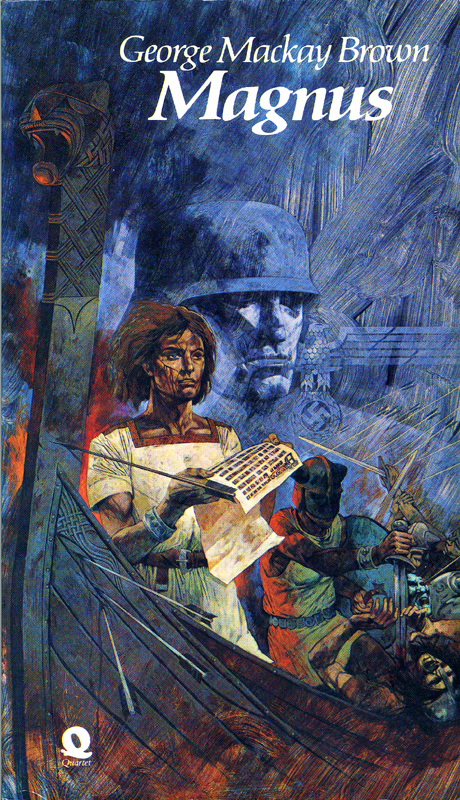 And then it is securely based in the Orkneyinga Saga, the history of the Earls of Orkney; is in fact a “dramatisation” of a section of that history, from the death in battle in 1014 of Earl Sigurd (holding the magical Raven Banner: if it was held aloft they would be victorious, but whoever held it would die; after several men had been killed, no one else would hold hold it, so he had to hold it himself) to the death of Earl Thorfinn in 1064. Mackay Brown seems to have lived through this period of Orkney’s history, and the reader lives through it with him. But that is not all. Our hero is Ranald Sigmundson who, after stowing away on Leif Ericson’s ship, lives for a while in Greenland and visits Vinland, then returns to Orkney worried about his old mother who must believe he has drowned, and there gets caught up in the farming life – and, briefly, politics, before becoming disillusioned with the earls and would-be earls and the factions and violence and lies – and spends the rest of his life resisting “the call of the sea” and dreaming of the voyages he made in his youth. The word Vinland here becomes almost synonymous with Tir-nan-og, the Land of the Young, the Celtic Elysium, set out in the sea, far away beyond the sunset, “where Ossian dwelt with Niamh for three hundred years before he remembered Erin and the Fenians”. A wonderful book. And read also, if you haven’t yet, Mackay Brown’s story of Earl Thorfinn’s grandson, Magnus, who died in 1117 as a result of more of the feuding that Ranald Sigmundson, in this book, hates so much. This is the story of Magnus Erlendson, Earl of Orkney in the Twelfth Century; or rather (as it says in the book) “half-earl”, for there were two heirs, Magnus and his cousin Hakon Paulson; the story of Magnus, the mystic, who cares for the seal injured by hunters, who sits in the prow of a ship reading a book during a great sea battle, and was born to be a saint. But he was also born to be Earl of Orkney, and half the islands support him. There is civil war, during which the islanders are reduced to poverty and despair. In the end, after three years of fighting, Magnus is killed by treachery when he agrees to meet his cousin for peace talks. George Mackay Brown, who died in 1996, was primarily a poet, and this is his most poetic novel, a long prose poem. He was also a superb short story writer and, like his wonderful first novel, “Greenvoe“, and the Booker-shortlisted “Beside the Ocean of Time“, this book reads like a series of short stories. Yet the same characters appear and reappear throughout, some (like the tinker couple, Jock and Mary, and Magnus’ boyhood companions) growing older along with Magnus, others (like the peasants Mans and Hild, and Bishop William) archetypes who are always there unchanging like a chorus in the background. And in the end it is not the death of Magnus at the primitive sacrificial stone that we witness at all, it is death at the end of the white corridor, the death of the Protestant theologian Dietrich Bonhoeffer at the hands of the Nazis. And Hakon Paulson’s foreign cook, whom he orders to ‘perform the sacrifice’ is called Lifolf – as is the officers’ chef at Flossenberg, who is called upon to hang Bonhoeffer in a special ceremony on April 9th 1945, one of the last executions of the war and performed at the express orders of Hitler himself. Unconventional yes, and in fact one of the best examples I know of the novel as an all-encompassing work of art, but not a difficult read. On the contrary, it is easy reading, and at times un-put-downable. There are moments and scenes which engrave themselves on your memory (like when Hild tells Mans to give the tinkers food and drink, and says “We’re only as rich as the poorest one among us”) and when you finish the book you feel you understand a little more of the nature of religion and of sacrifice, and of man’s place on the earth – and indeed in the universe. George Mackay Brown returned to Earl Magnus in the short story The Feast at Papay, which, for those – like me – left thirsting for more, forms a delightful postscript to the novel. It is included in his short story collection Andrina, and is also highly recommended.